Prudentius (born 348; died after 405) was a Christian Spanish lawyer who, late in life, turned to writing. Among his most important works is the 'Psychomachia' (Conflict of the Soul), an allegorical poem concerning the struggle between female personifications of Virtues and Vices for the human soul. Most illustrated copies of the text (including three in the British Library) seem to be descendants of a 5th- or 6th-century exemplar. This one was probably made at the abbey of St. Albans. Sobriety holds up the Cross of Christ in front of Indulgence's chariot, causing the horses to stumble and fall. 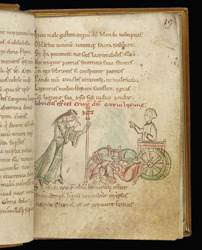 The figure standing in the chariot is apparently a much later addition.